The term iPhone killer is bandied about as anything that reacts when you poke it…though cats are likely to be giving Apple a headache soon under that theory. 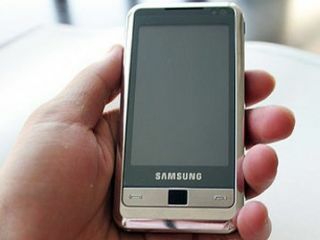 But the world has gone slightly touch screen mad, as the leaked pics of the Samsung i900 reveal. It does look very nice, and sports a great feature list to go with it. Windows Mobile, a large 3.5” screen and WQVGA resolution of 240 x 400. All nice so far. Add in the rest of the high end specs you’d expect from such a device - 16GB internal memory, 256MB RAM, 5MP snapper, WiFi, Bluetooth 2.2 EDR, HSDPA and microSD support. The phone has previously lived in the fan boy dungeon for the last six months or so, with the odd fuzzy / mocked-up photo to keep Sammy fans going. But the new picture set shows it’s surely close to release, though no word on price and availability yet.